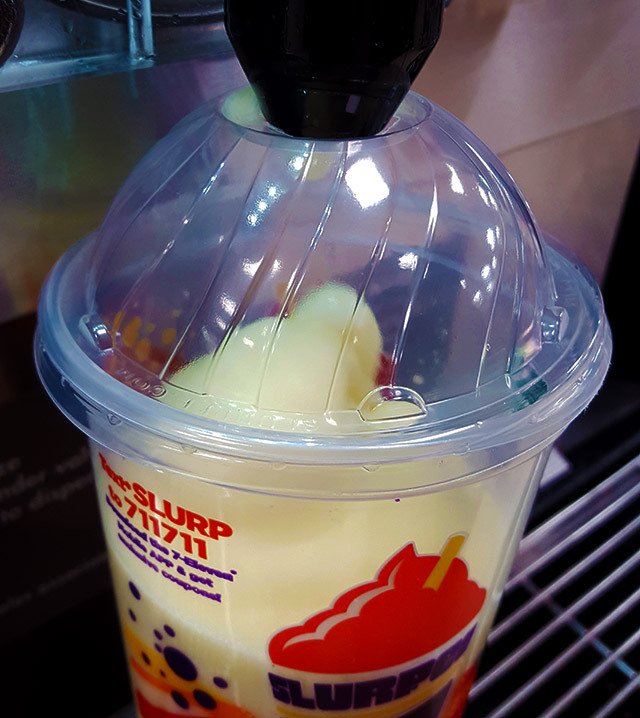 7-Eleven's Ghost White Gummi Slurpee! | Dinosaur Dracula! 7-Eleven’s Ghost White Gummi Slurpee! This article will be short and sweet. Extreme emphasis on the sweet. I dropped by 7-Eleven for an enormous cup of coffee, meant to be my fuel for an entirely different sort of article that I’d planned to write today. Suffice to say, my priorities have changed. The ghastly bears, the creepy forest background, the word “ghost” — it took me a minute to realize what I’d stumbled upon. When the image became one and it finally hit me, I lost control of every bodily function and could only communicate via singsongy riddles. My friends, do you know what you are looking at? 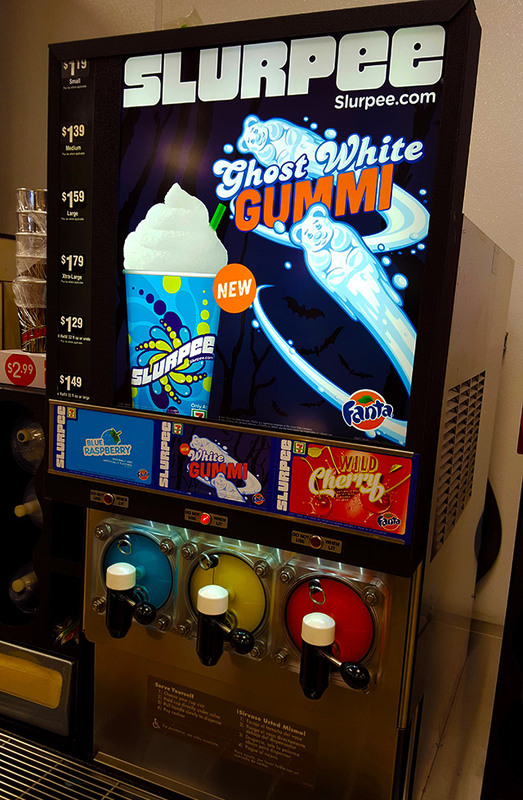 7-Eleven’s Ghost White Gummi Slurpee is made with Fanta, but a very specific type of Fanta that somehow tastes exactly like white gummy bears. Gotta give 7-Eleven credit: I think about potential Halloween Slurpee flavors at least 15 times a day, generally at the top of each hour. Even with all of those daydreams, I never imagined something this bizarre but SO PERFECT. Of 7-Eleven’s six Slurpee dispensers, naturally this was the only one that had the red button lit. Meaning I had to wait an extra 15 minutes for it be ready. Trying to kill 15 minutes in a 7-Eleven is easier than it sounds, and it’s even tougher when you want to look inconspicuous. I guess I could’ve stood in front of the Slurpee machine and made it obvious that I was there for that, but where most people have blood and organs, I only have shame. I was too self-conscious to let the oblivious cashiers think I was that into Ghost White Gummi Slurpees. Instead I read the ingredients on various packages of ramen, which at the time seemed like a more normal thing to do. Finally, I got my prize. 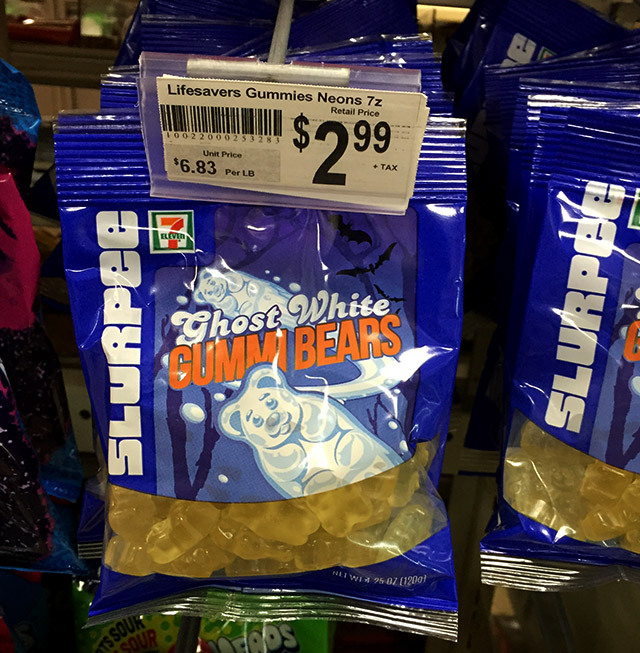 7-Eleven’s Ghost White Gummi Slurpee tastes EXACTLY like white gummy bears. It’s a dead-on match, to the point where even if I didn’t know the name or theme, I absolutely would’ve compared the flavor to white gummy bears. I can’t say that I’ve ever signed petitions to make white gummy bears a Slurpee flavor, but my God, it works! It’s super sweet and sort of wine-like, and the pale color looks eerie enough to pass for Halloween. 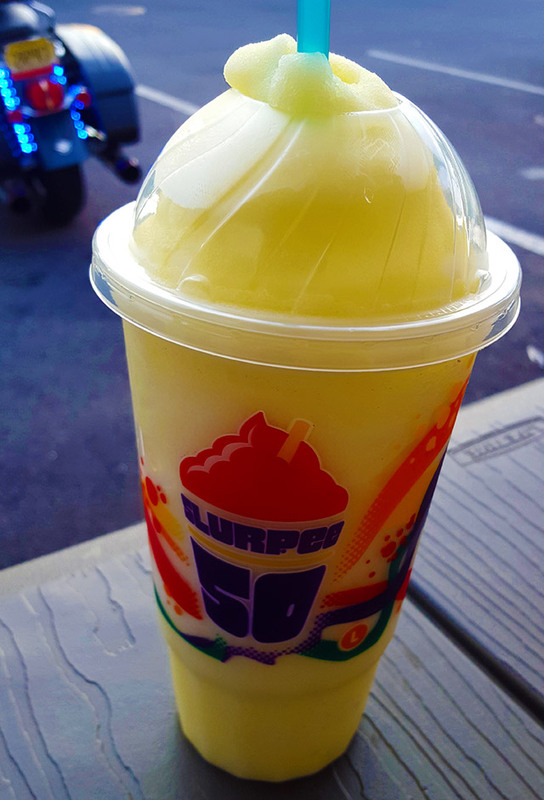 I love this Slurpee, and it’s now guaranteed to become one of the things we gush over when reminiscing about the 2017 Halloween season. 1) I thought I had the spooky scoop of the century with this news, but it turns out that my boy Sammy Hain already tweeted about the Slurpees yesterday. And like, Sammy, you know I love you, but now I have to destroy you. 2) As highlighted on the official Slurpee site, you’re supposed to get a special Halloween Airheads straw when you buy one of these. I don’t think my 7-Eleven had the straws, but I can’t rule out the possibility that I’m just too stupid to look sideways. UPDATE: I finally found the damned bears. The world is rosy again. 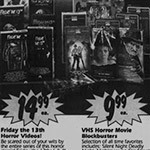 ’80s & ’90s Halloween Newspaper Ads, Part 3! 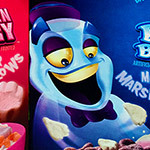 The 2017 General Mills Monster Cereals! Raiding Alice’s Fridge from Friday the 13th Part 2! 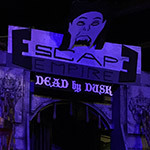 Purple Stuff: Escape from Castle Dracula! 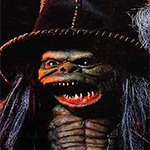 The Official Ghoulies II Music Video! 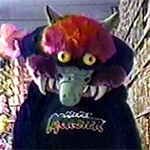 My Pet Monster, LIVE at Toys “R” Us!